Danny Plastics has been manufacturing and exporting products such as screen door globally since 1983. This item is made from UV resistant PVC foamy material and fiberglass, therefore it can block the detrimental substance from the sun. The production line of the screen door was guarateed by ISO9001:2000 certificate and SG MARK certification from Japan. 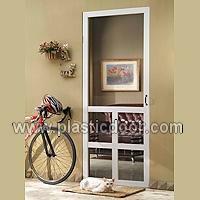 Enjoy the fresh air flowing into your home in mild wether by using screen doors manufactured by Danny. These exterior, window-like doors fit over your front and back doors. Any standard screen door hardware can be used to install, and any color(except black) can be repainted. It will be much more convenient to design your own screen doors. Moreover, we provide worldwide customized OEM/ODM service if you have more specific requests. You can have it with high quality in minimum price. Please do not hesitate and contact Danny immediately to order your interior screen door. We are definitely your best choice. Address: 12F, No.426, Min-Chuan 2nd Rd. Kaohsiung, 806 Taiwan R.O.C.